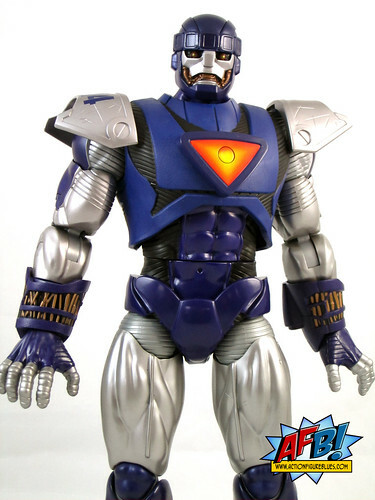 Hasbro's Marvel Universe Sentinel is a Giant in Stature and Style! 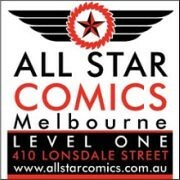 Seeing that my buying obsessions... er, habits.... are starting to lean more towards statues, I’m having to have a hard look at which action figures I’m collecting. I don’t know if Hasbro’s Marvel Universe 3 ¾” line will make the cut in the long run, but there was so way I was passing up on the Marvel Universe Sentinel! Last year I was so keen to get my hands on the similarly sized Galactus that I bought the SDCC Exclusive Version from an eBay auction - not realising the trials that would come with trying to get the size of the box he came in to Australia. Thankfully I bought that item from a most understanding eBay seller, but once through that was enough - this time I decided to be wiser for the experience and happily settled for the non-exclusive version of Marvel’s Main Mutant Hunter. I wasn’t collecting action figures enough to buy full waves of Marvel Legends in the serious Build-A-Figure days, so the chance to own a large scale Sentinel is one I couldn’t pass up. I’ve been anticipating this one ever since Galactus was announced, and there’s no disappointment with this big fella, let me tell you! 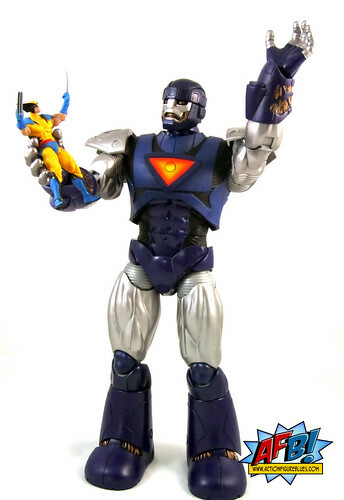 Unlike the Exclusive version’s classic comic colour scheme, the regular Sentinel comes with a silver face, upper arms and thighs instead of purple. It’s a simple change that creates quite a striking effect, and I don’t mind it at all. The paint on my Sentinel is fantastic from head to toe. There is quite a bit of sculpting detail to be found on this piece, from the plating of the Sentinel’s armor to the circuitry which is visible at his ‘joints’. His headsculpt is extremely well done, and I quite like the detail on his hands as well. Like Galactus before him, the Sentinel comes with sound effects, and in my opinion these are a great improvement over Galactus’ as the voice is much better, and the sayings, like “Mutant Detected”, are ones that we’re familiar with. There are light up features as well, mainly flashing eyes that go along with the different sound effects - these really add to the fun! Like any sound-producing toy, it can be a bit irritating if over-repeated, but good fun as a novelty. It's worth noting that this comes with the batteries installed, so if you don’t plan to use the sound effects or if you are planning to store this, don’t forget to remove them to avoid damage from the batteries when they get old or, heaven forbid, if your Sentinel ever gets wet! Whereas I’ve always found Galactus a little challenging to keep balanced in different poses, the Sentinel has no issues - possessing bigger feet and no giant head-dress probably helps! This means that you can make the most of the Sentinel’s articulation for a number of different poses - my favourite being holding a tiny mutant in his hand. The Sentinel is much more flexible than Galactus - I’m not sure if this is due to any changes in design or simply that Galactus’ costume and sculpted pieces were more restrictive, or simply that my Galactus has stiff joints, which would be understandable considering his age, height and constant standing. Whatever the reason, it’s a welcome change. Speaking of tiny mutants, the pack-in 3 ¾” figure for this set is Wolverine - which is such a relief since he’s been such a long-awaited figure in the MU line...... Yeah, the choice here could have been more inspired. Considering that no one is going to decide to buy or not buy a giant figure on the basis of the tiny pack-in, Hasbro could have gone to town with this one, and thrown in a choice we haven’t seen yet, like Banshee. Even using Nightcrawler, who appears on the packaging would have been a more interesting choice instead of the most over-used character in the line. Le sigh. That’s a side note really, since the Sentinel really is the main event, and he is such a beauty. This is the sort of thing that keeps me coming back to the Marvel Universe line - Hasbro has certainly made an effort with oversized figures, and happily they work at the Marvel Legends scale as well, which means even if I ultimately finish collecting MU when Legends returns, these larger items will fit well, and so will the smaller oversized figures like Giant Man and Goliath - all very nice additions to the overall Marvel Toyverse - whatever the scale. The question now is, where does Hasbro go from here in terms of these giant figures? Is there a character that could work as next year's SDCC Exclusive at this same scale? Who would you like the see as the next in the line? You can see more pics at Facebook, discuss this at the AFB Forum, and you can comment on this post to enter the November AFB Comment of the Month Contest! I love this figure. Perfect execution. I want a dozen! More!! Next year, hmmm....Red Ronan? Eternity? Celestials? The Living Monolith? Fin Fang Foom? Just one small note of disagreement I know I would hate it if the only way I could get a favourite character was by purchasing an expensive thing like this fella. Mind you how cool is he and hell yeah if money was no issue I would take 5. I was fortunately able to get my hands on the exclusive version of the Sentinel. Whichever color scheme, it is a pretty great toy. I was wondering what oversized figure they could make next, but I haven't come up with any good ideas so far. Fin Fang Foom is the next Masterworks figure. It's the Marvel Legends version with an orange paint scheme and cloth pants. That's pretty impressive. 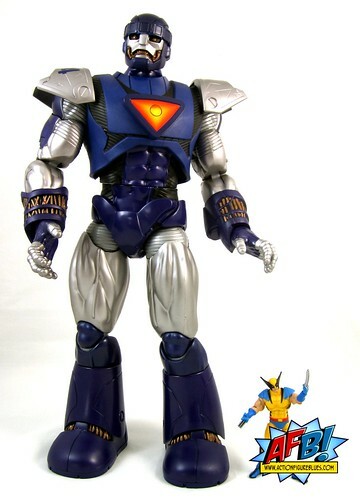 I've got 3 of the Marvel Legends BAF Sentinels, but I'm tempted to pick up one or two of these MU versions. i def need a Sentinel to keep my mutants in check, however i just cant bring myself to buy one of these! its the colours!!! when you say Sentinel i think purple and pink... so maybe i will pickup one of the purple/pink classic colour ones at extra cost. also i wanted to just say that; side by side you can see that most of the parts are actually re-used from Galactus, and that is just lame.